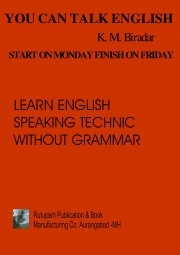 Description of "You Can Talk English"
This book enables you to learn English without Grammar. You Can Talk English -This book is already been published in Marathi language.Now it is available in English language. Reviews of "You Can Talk English"